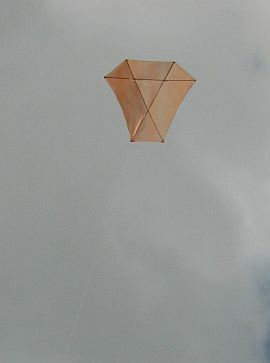 With the Dowel Barn Door kite in hand, Aren and I walked onto the Wilfred Taylor Reserve in the early afternoon. The grass seemed slightly wet. But I think it was an illusion created by lots of recent growth. Some sunshine at last, today, after very frequent rain over many days. A gusty very light wind was blowing down low, but at this location there is usually a sharp increase in wind speed just above tree-top height. Anyway, I still decided to shift the towing point back a few mm (1/4"). While standing still there didn't seem to be quite enough wind to launch the kite. So, I just popped it up to about waist height during a faint gust. From there, it was fun to walk backwards while keeping the kite hovering over the grass at about head height. Letting line out slowly, the whole time. After a minute or so of this, it wasn't hard to climb the Dowel Barn Door kite right up, with about 20 meters (70 feet) of line out. Time for some photos and video! The kite was close enough to get good images, and yet also high enough to fly reliably in the variable but slightly stronger wind. After getting all the imagery needed for this flight report, I let Aren (4 1/2) fly the pale orange Barn Door for a while. He's getting bigger and stronger all the time, and more comfortable with flying the Dowel kites in light conditions. Only it wasn't so light up there any more, and he started started complaining about it 'pulling too hard'! I promptly took over. Now, I often hatch a little plan for climbing out a kite to 400 feet. You know, float it out to a long line length and then let it climb up by itself. Or perhaps climb it out at a constant line angle of 45 degrees. Not today. The Dowel Barn Door kite rather haphazardly climbed to around 300 feet. I just let line out from time to time as I felt like it. The wind up higher seemed to be gusting just occasionally to near moderate strength, putting a slight bow in the normally straight side edges of the sail. 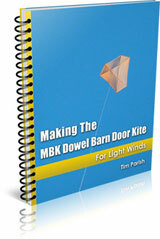 Finally a nice thermal came through, and the Dowel Barn Door kite headed heavenwards. With more line out, more than 120 meters, the Barn Door ended up floating about at 400 feet. The kite seemed to spend forever at 70-80 degree line angles, the line hanging vertically before arcing back a little to where I was standing. The flying line also formed a long S-bend or 2 as the winds pushed it in slightly different directions, depending on altitude. I might as well mention a few other flying things that invaded my kite's airspace too... A few pink and white Galahs, some small but fast-flying birds and in the distance, the sparkle of a sizeable flock of White Cockatoos. No Kookaburras this time, although we heard one here a few weeks ago! After an hour or so, it became harder to keep the Dowel Barn Door kite up high, and I started to work the line a bit more. The wind strength had dropped off so much that there seemed to be almost no breeze at all down low. Unfortunately, my efforts to keep the kite up had the side effect of working one of the diagonal spars out of its corner strap! A long slow descent followed, with the kite looping more or less continuously to the right. Slow loops, but fairly tight in radius. I managed to get the kite down on the grass fairly softly. Soon the spar was back in and the sail re-tensioned. With the wind fading, the Dowel Barn Door kite never made it back up to 400 feet, but it still had some reasonable flying for the next 20 minutes or so. Eventually, I found myself winding in furiously as the kite just sank relentlessly towards the ground. It wasn't a bad outing, considering the weather has been almost unflyable for weeks, with frequent rain and very fresh winds. It's been the wettest August here for many years. The story above was an actual flying experience with the described kite. My write-ups are definitely warts-and-all since things don't always go totally as planned. However, half the fun of kiting is anticipating the perfect flight. When it happens, it's magic!